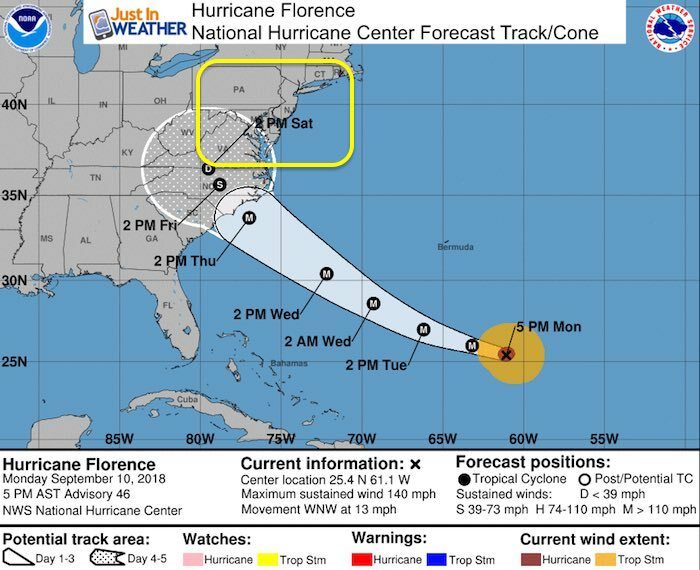 A State Of Emergency was declared today for Maryland by Governor Hogan for Hurricane Florence. I will address the local possible impacts, but please note this is NOT a promise the storm hits here. It frees up resources and puts many on alert for any possible changes. I know a lot of comparisons have been made to Isabel, but there are differences as well. 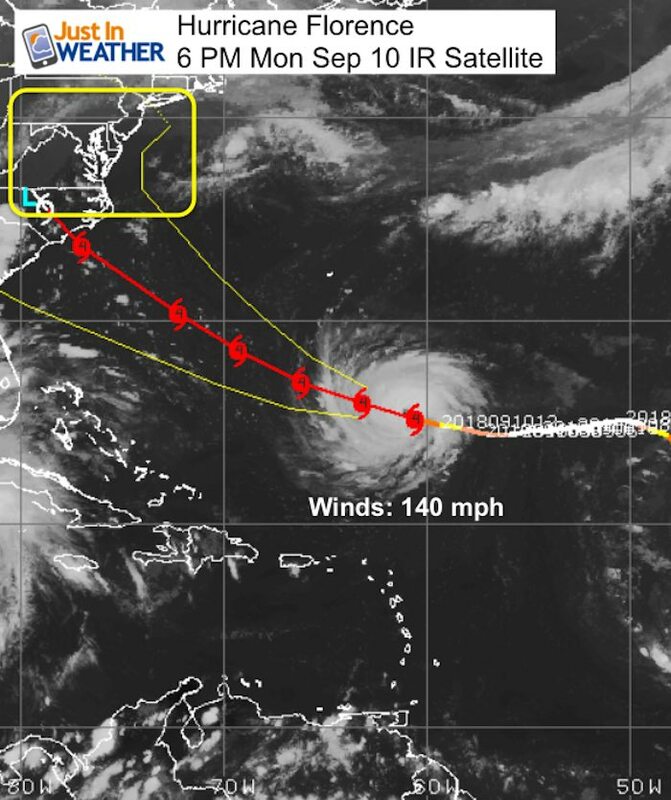 The State of Emergency in South Carolina and North Carolina include evacuations and rightly so. That is where the hurricane is expected to make landfall. 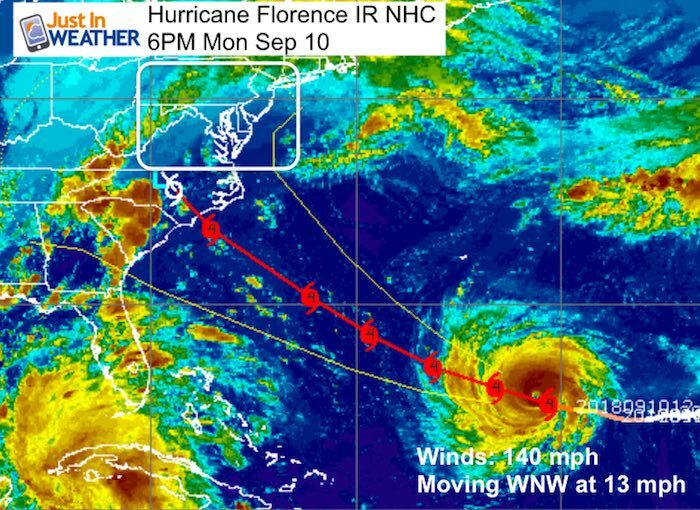 Below info includes the latest update, satellite, and computer model forecast maps. Winds were up to 140 mph solidly a Category 4 at 5 PM. There seems to be agreement on landfall Thursday for North Carolina, but the storm will crawl or stall inland. That will dump a lot of rain of some areas and just scrape or miss others. Larger: The hurricane force winds reach 40 miles from the center. Yesterday it was only 15 miles. The tropical storm force winds reach 150 miles away. This looks healthy with a symmetrical core and cirrus outflow around the edges…. But there us some dry air feeding into the southeast corner. 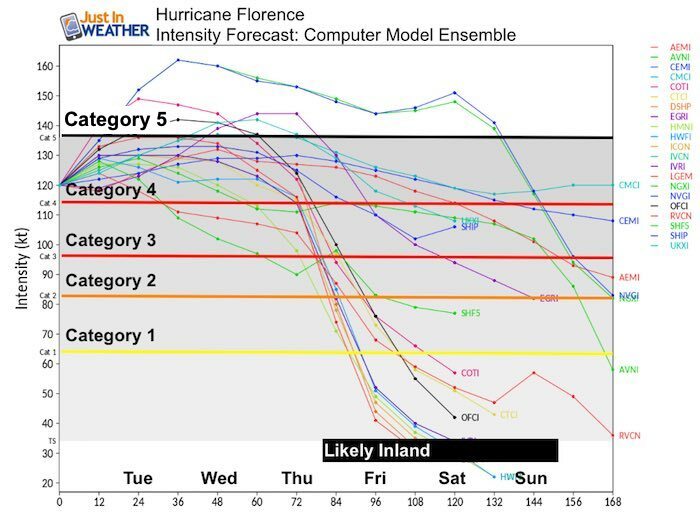 Florence could go through some fluctuations over the next 24 hours. But there is a lot of support for it to maintain or grow stronger through Wednesday. 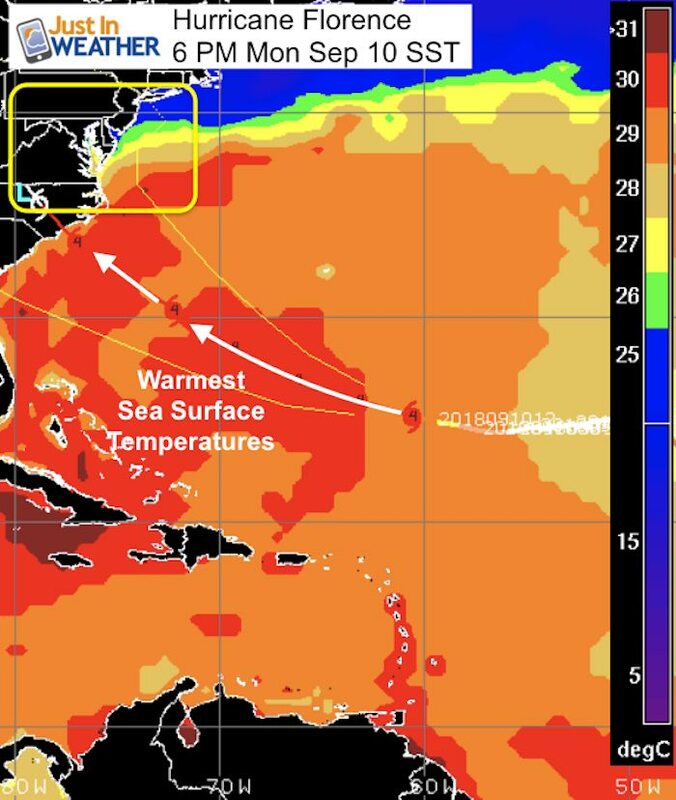 The most important part of this plot is the SST (Sea Surface Temperature). The red shading is over 30ºC or 86ºF. That is VERY WARM and energy to help sustain or grow Florence. 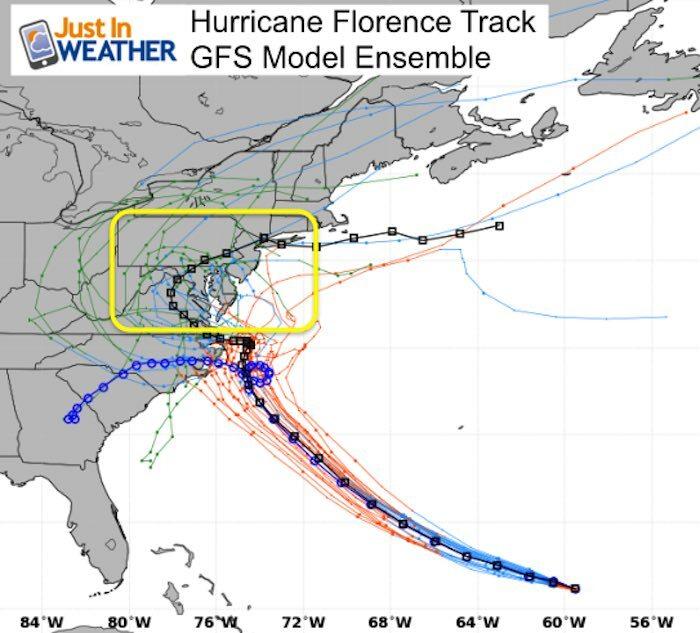 The modeling seems to be locking in on North Carolina. I keep mentioning Wilmington, but there is a good 150 to 200 miles of coast in play in both directions. 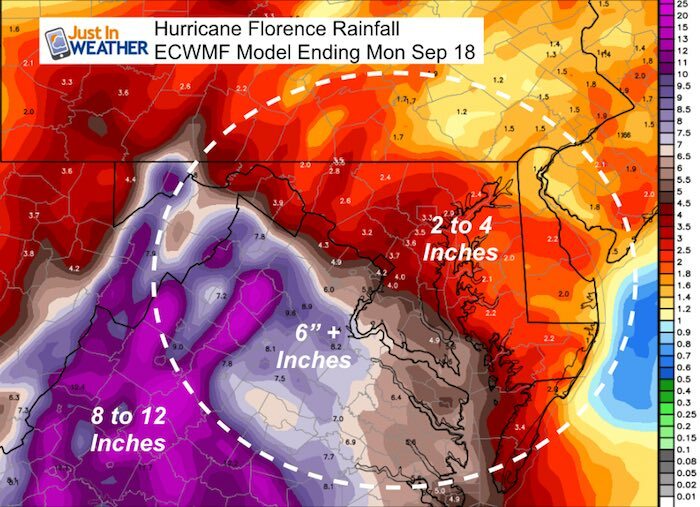 Maryland: This will NOT hit Maryland directly. The concern in addition to rip currents and beach erosion is surge up the Chesapeake Bay. The water and wind flow is critical to watch for any influence up the Chesapeake. 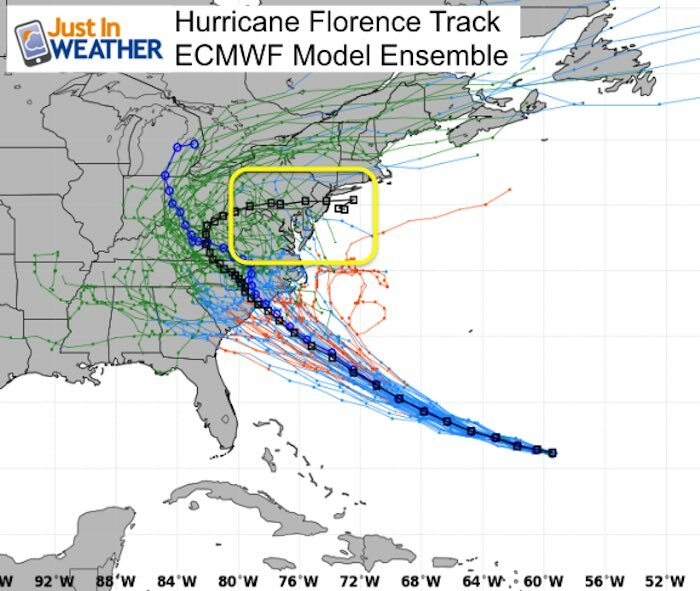 ECMWF – European Model suggest the winds may be from the east and Northeast. around High Pressure in New England. If so that would limit the surge up the coast, but still expect higher water. 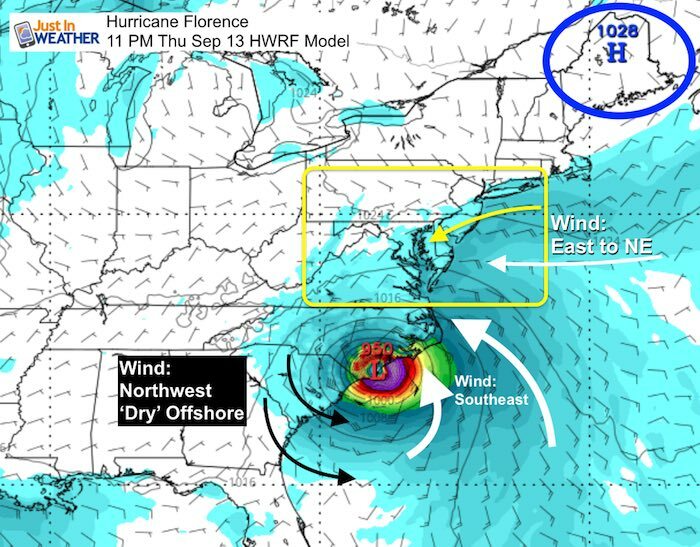 HWRF – This model suggest that the wind and thus water flow may be more from the east and Southeast. That would push more water up the Bay. Yes, there is agreement on the North Carolina hit. The curve back into Maryland and. 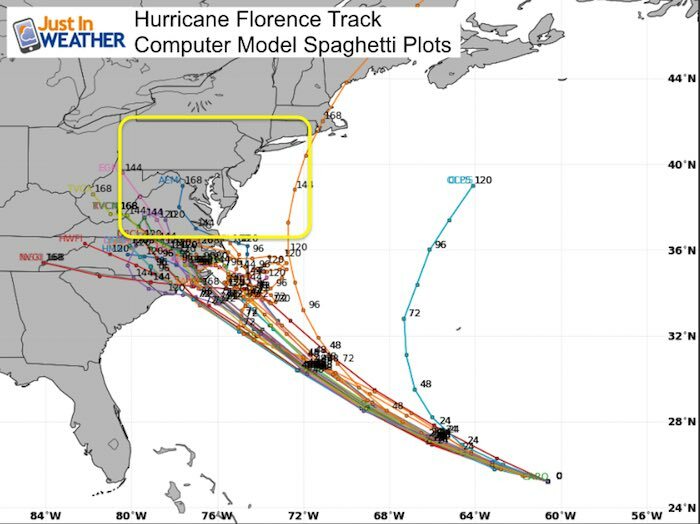 Southern PA in the black line is 5 days after landfall. That would be a much weaker remnant system, but could bring heavy rain. This model ensemble is all over the place. As of this morning it was in agreement with landfall, just father north. This afternoon it went back t the stall offshore solution. 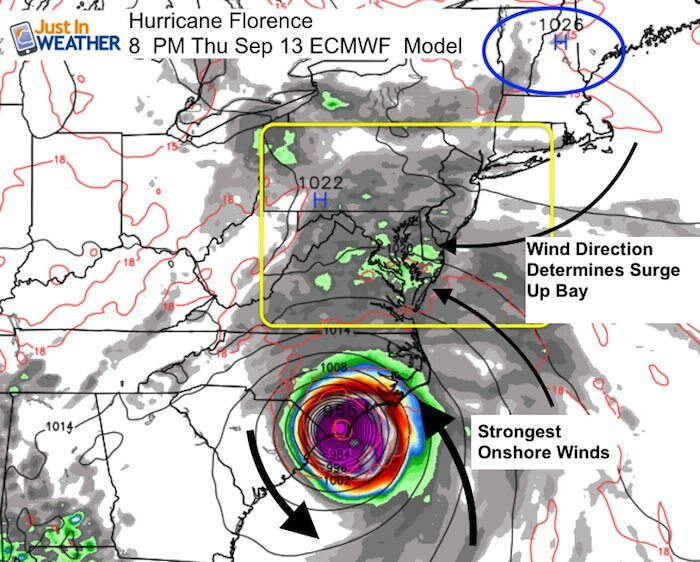 Note Landfall Thursday afternoon or evening. But Saturday a depression at the VA border. Heavy rain is a real threat far away from a landfalling tropical system. The latest modeling does show over a foot of rain in some areas and I think that may be under playing the potential. However, the worst of the rain may remain locked to our south. 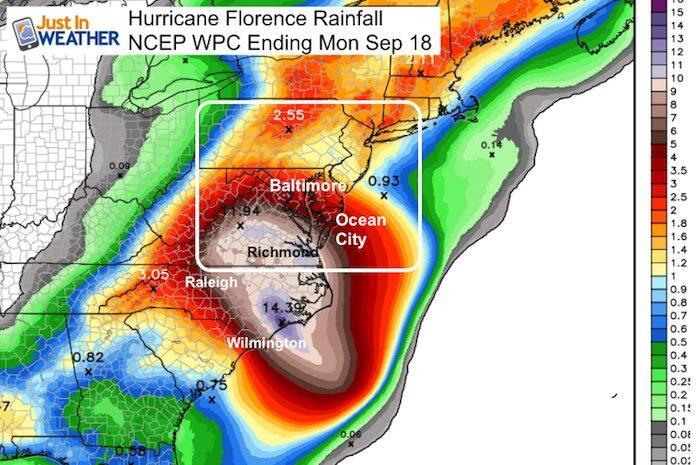 How will it impact Maryland/Southern PA/Delaware? Flooding risk comes from rain falling down and water being pushed up the Bay. 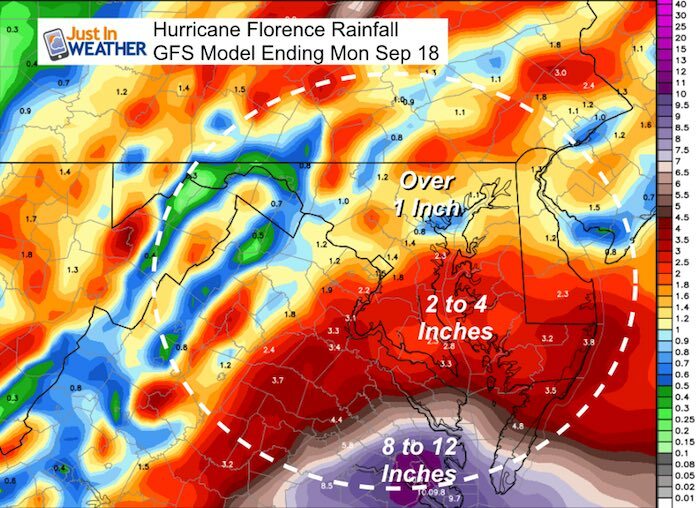 At this time I see our region getting rain from a stalled front and eventual some of the moisture from Florence…. But the core of the storm will be well to our south. I do not want to downplay the potential here. It could be bad should we see any shift to the north of the track. The beaches will have erosion and the Bay will have high water. We have already seen record rain and high water remains, so a little more could be a big problems.